Business Insider was invited to attend the first arrival of Emirates’ new daily flight from Dubai to London Stansted on Friday. Since the new three-class Boeing 777-300ER – which features first class private suites and refreshed business and economy class cabins – was first unveiled at the Dubai Air Show in 2017, there has been a lot of buzz surrounding the new offering. 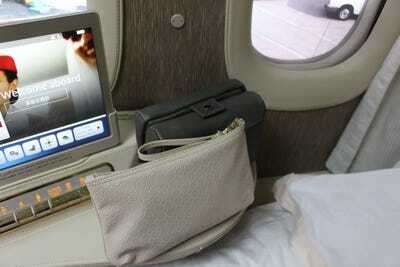 Emirates’ new route also marks the first time an airline based in the Middle East has operated out of Stansted. 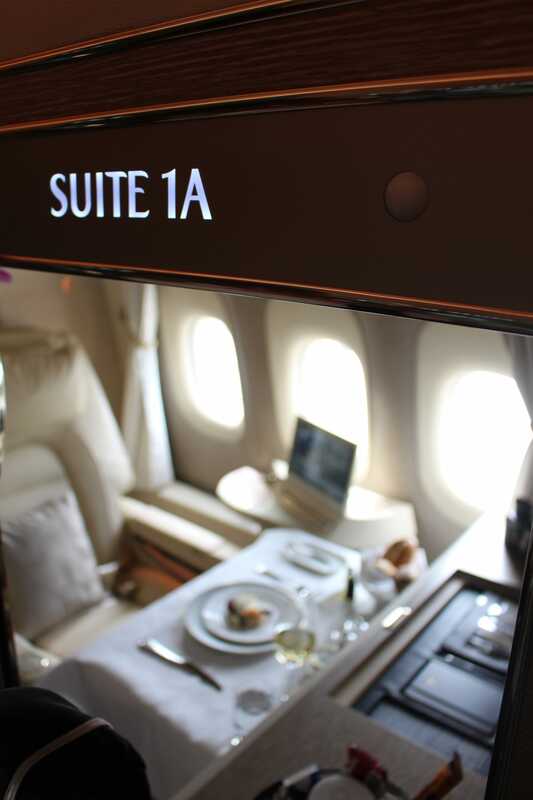 Naturally, the first thing we wanted to do was check out the airline’s new private first class suites to see if they lived up to the hype. 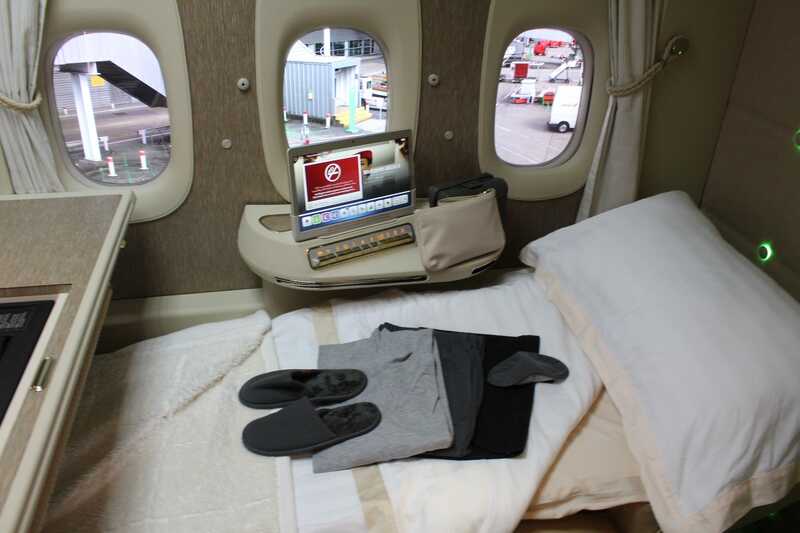 We took a tour of the grounded plane to check out the amenities – and basically pretended we were first class passengers for the day. 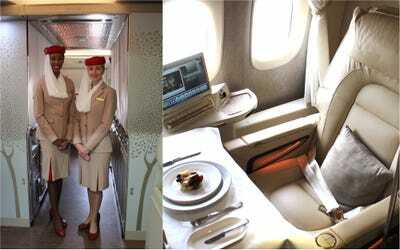 Scroll down for a look at what Emirates’ new private first class suites are really like. 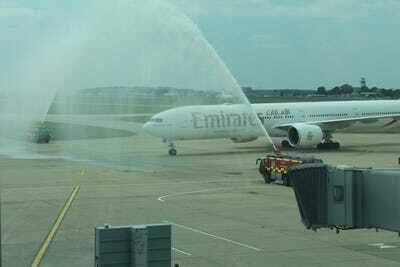 We were invited to attend the first arrival of Emirates’ new daily flight from Dubai to London Stansted. As is customary to celebrate an inaugural flight, the brand new Boeing 777-300ER received a ‘water salute’ where it was sprayed with arcs of water from two cannons on fire trucks. The first thing on our minds was checking out the new private first class suites. 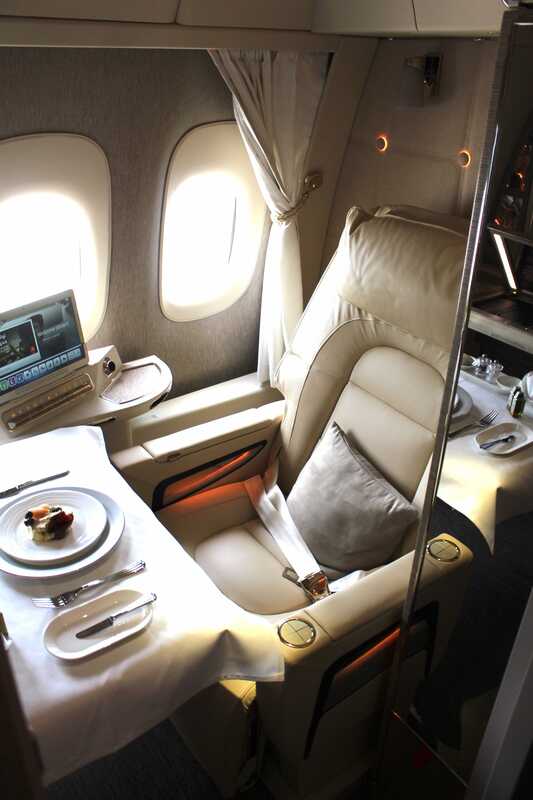 They are fully-enclosed private cubicles, which were inspired by the Mercedes-Benz S-Class — and have floor-to-ceiling sliding doors, and soft, plush leather seats that convert into a lie-flat bed. While we didn’t get a chance to sample it ourselves, the food and drink offering looked just as fancy as you’d expect, all served on a crisp white table cloth. 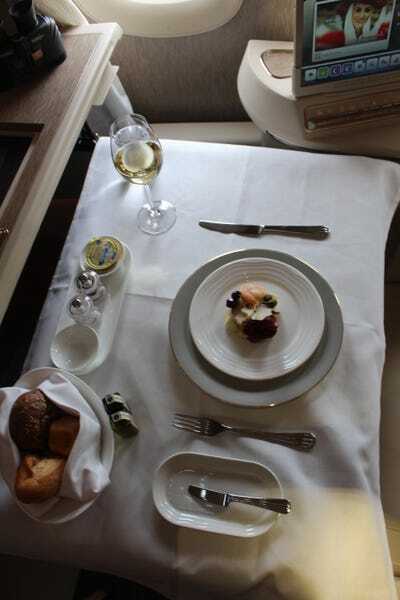 First class customers even get their own mini bottles of olive oil and balsamic vinegar, as well as salt and pepper grinders, and a bread basket. There are abundant snacks in the private compartment’s personal mini-bar, including soft drinks and sparkling water, as well as plenty of chocolate and savoury snacks — you definitely wouldn’t go hungry. 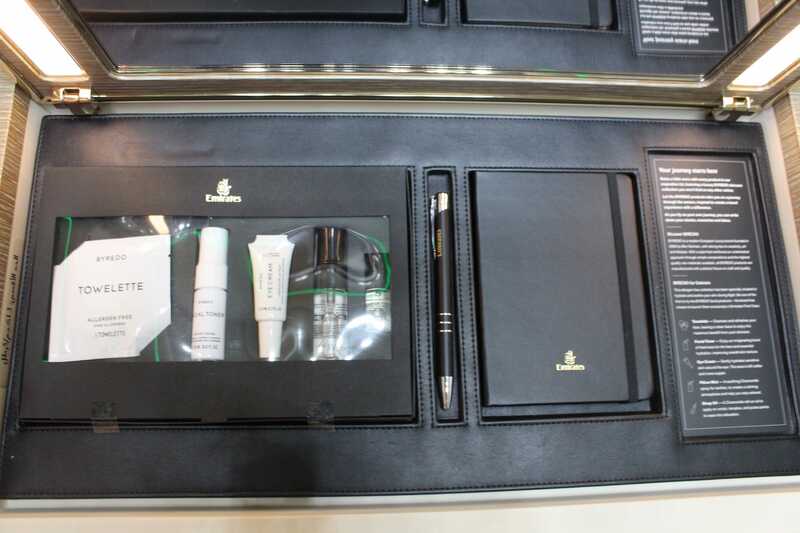 The desk opens up and inside there’s a collection of luxury Byredo skincare products, including a towelette, eye cream, and facial toner, as well as an Emirates-embossed notebook and pen. 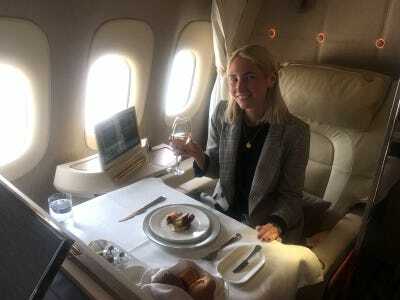 First class guests also receive Bulgari amenity kits, as well as Hydra Active moisturising pyjamas and slippers for the ride — and the bedding and plump cushion felt pretty comfy. The suite is certainly spacious. 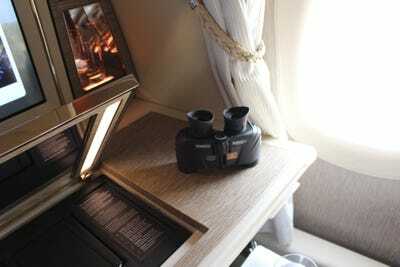 …And binoculars in case you fancy having a look out the window. The latest feature to gain media attention? The new ‘virtual windows’ located in the middle aisle of the suites. 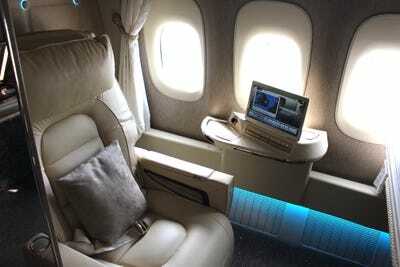 Emirates president Sir Tim Clark recently told the BBC that the images through the virtual windows were “so good, it’s better than with the natural eye,” adding that ultimately the airline plans to remove all windows from future planes, which could in turn make them lighter and faster. However, after seeing the suites that don’t have real windows, I’m not entirely convinced by the aesthetic. 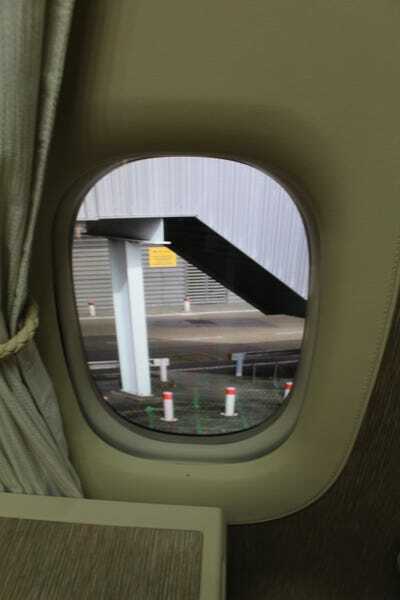 As the plane was grounded at the time of our tour, the virtual windows projected a view of the airport grounds outside the aircraft using real-time camera technology. 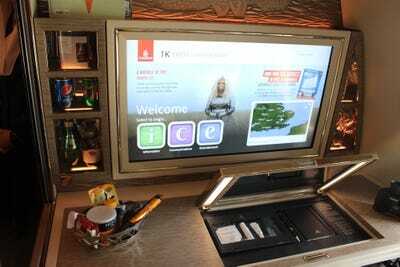 While the technology is cool, you can certainly notice a change in the light in the virtual window cabin compared to the suites on the left and right hand aisles which have proper windows – the virtual window suites didn’t feel quite as luxurious, in my opinion. However, reviews of the windows by people in the industry have so far been positive, so perhaps when the view they’re projecting is of mountains and other landscapes, this feature works better. 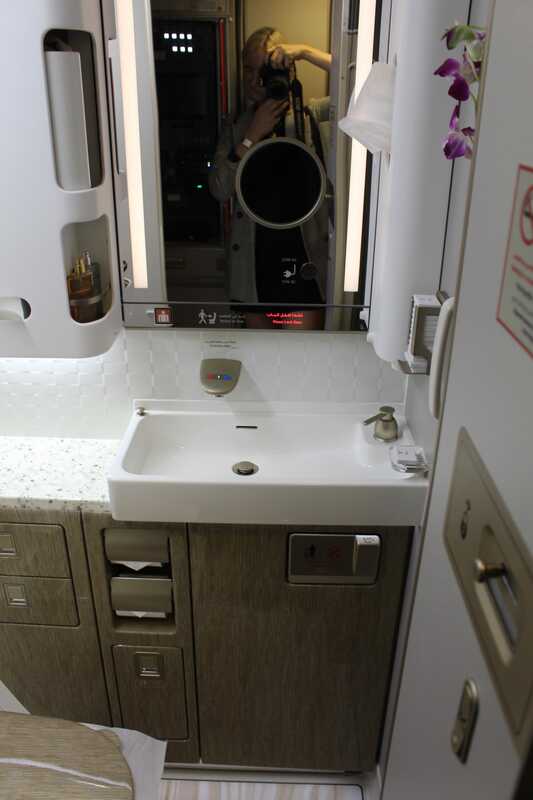 Virtual windows aside, the suites were certainly plush — unsurprisingly, even the toilets were fancy. They were decorated with a faux wooden finish, and stocked with free perfume and cologne. 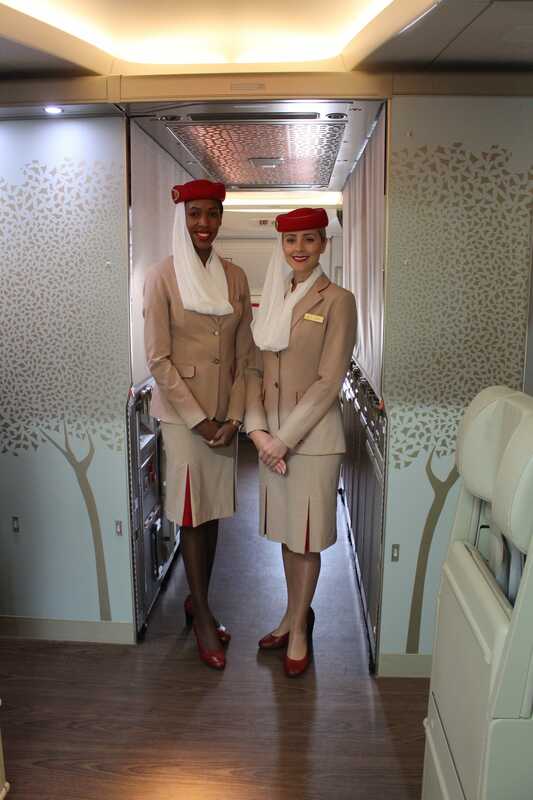 And throughout the aircraft, the flight attendants looked just as glamorous as you might expect — all of them wore a matching signature red lip.